Breezy Blooms, the first collection from artist Susan Rooney, starts with garden flowers. Lots of 'em. You'll also notice dotted lines that swirl, an idea the carries through pretty much every fabric in the collection. I've been a licensed designer for a very long time. I've been doing greeting cards and other types of product design. 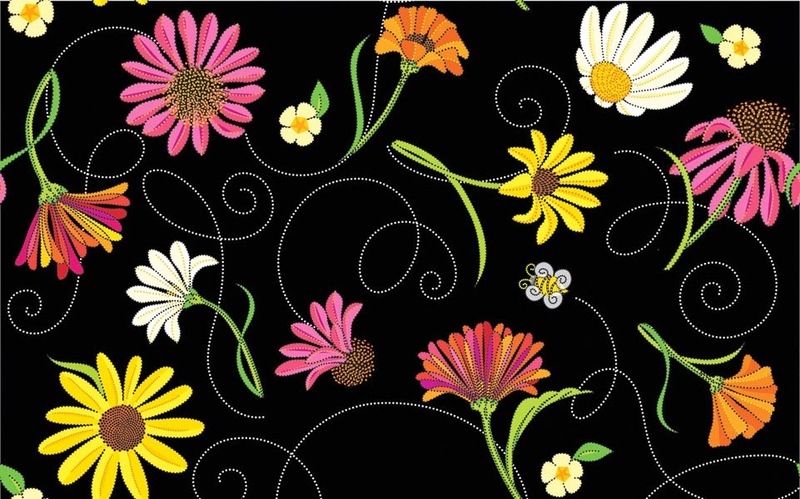 Now I'm designing fabric as well, and I've teamed up with Ruthann Stillwell, a sewer/quilter to design and write patterns..
What was the starting point for Breezy Blooms? It was hard to choose where to start, because I have such an extensive line of designs for licensing. 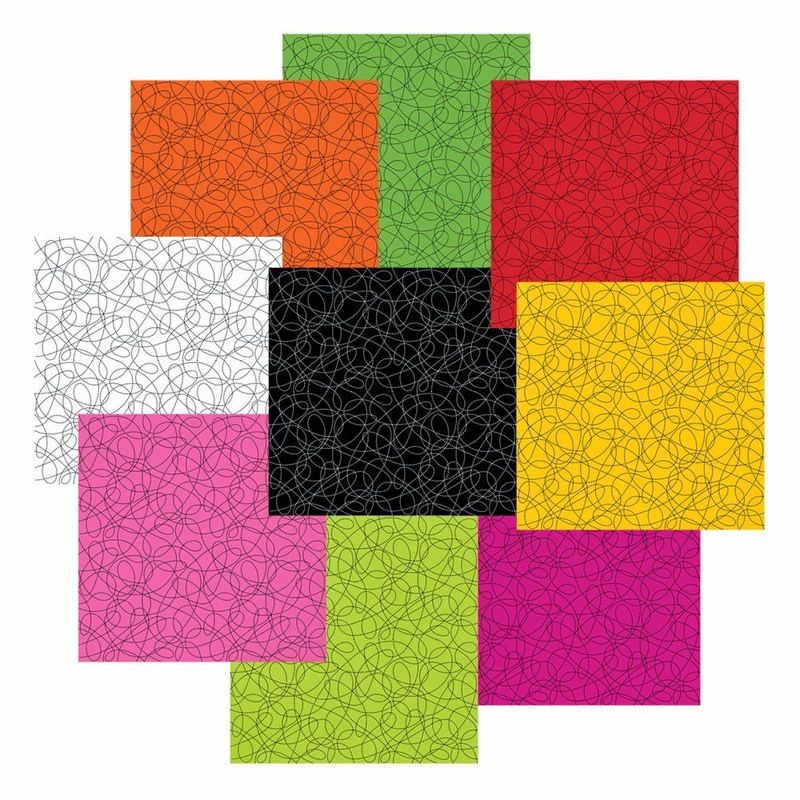 Benartex suggested focusing on bright colors. I'm all about bright colors. 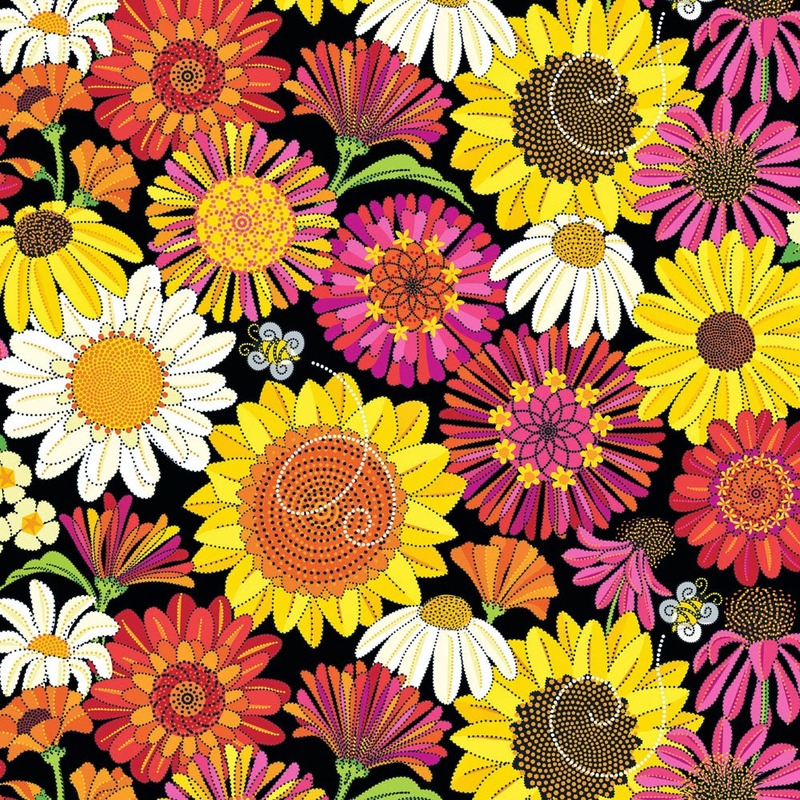 We picked some florals in my portfolio and began adjusting and changing them for fabric. 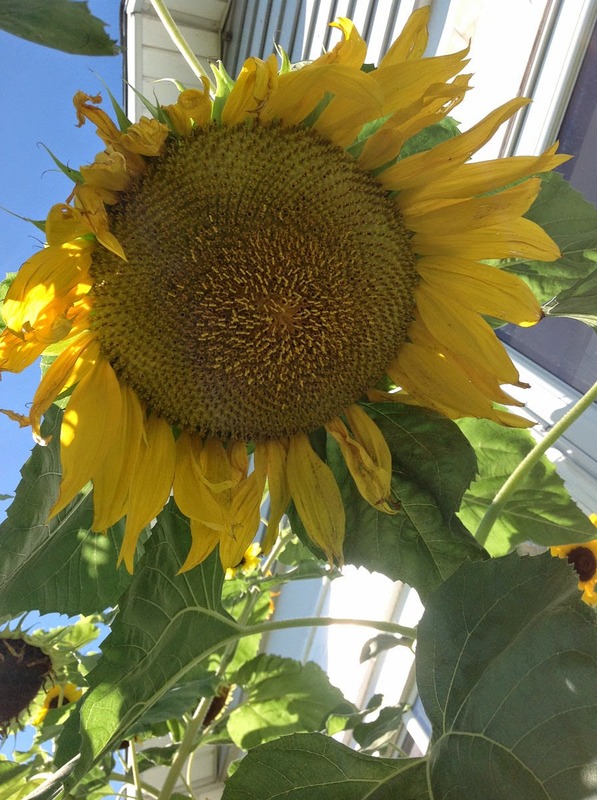 I always like looking at intricate things—the center of a sunflower—it has that whirl in it. Such an amazing pattern to play off of. 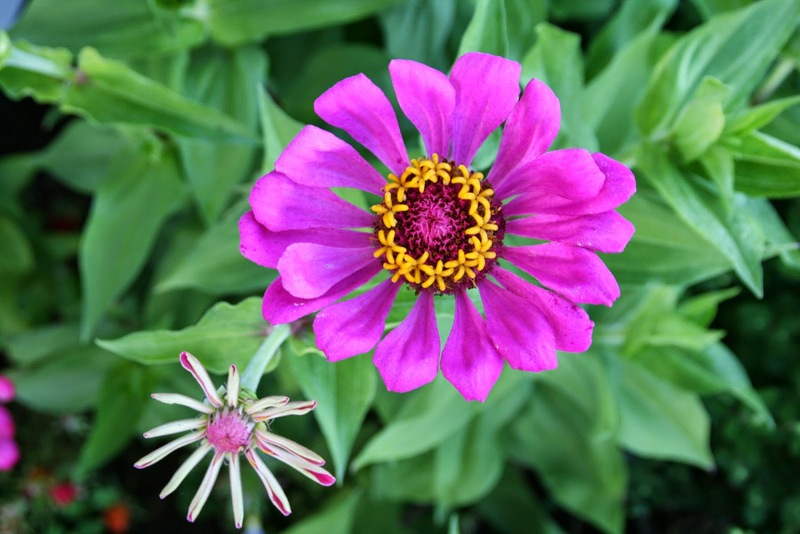 Or zinnias, which have a little flower within the flower. I had a bunch of flowers in my garden, and I used photos to help design the fabrics. One of our favorites is the plaid—how is it different from a typical plaid? 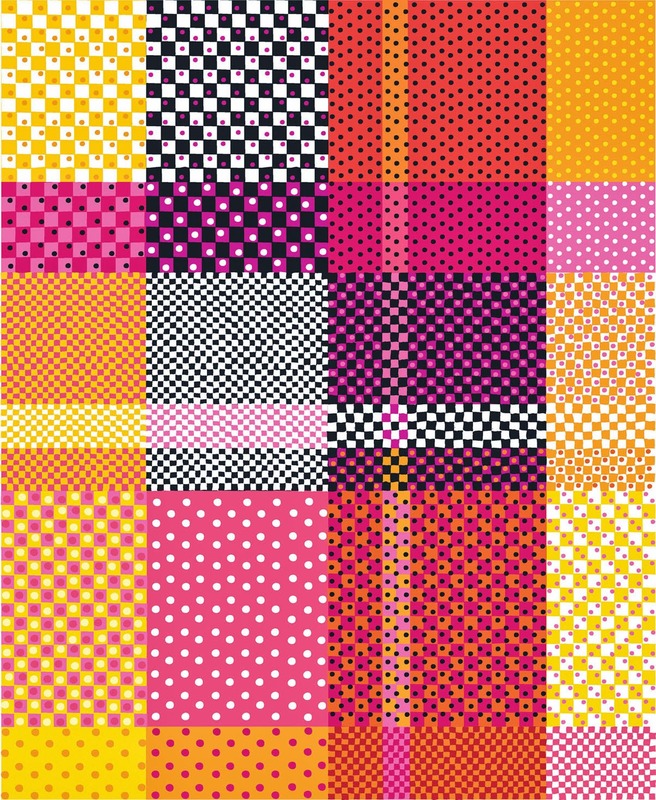 I call it a progressive plaid—the pattern is made out of dots and squares—all those textures and colors in one fabric. 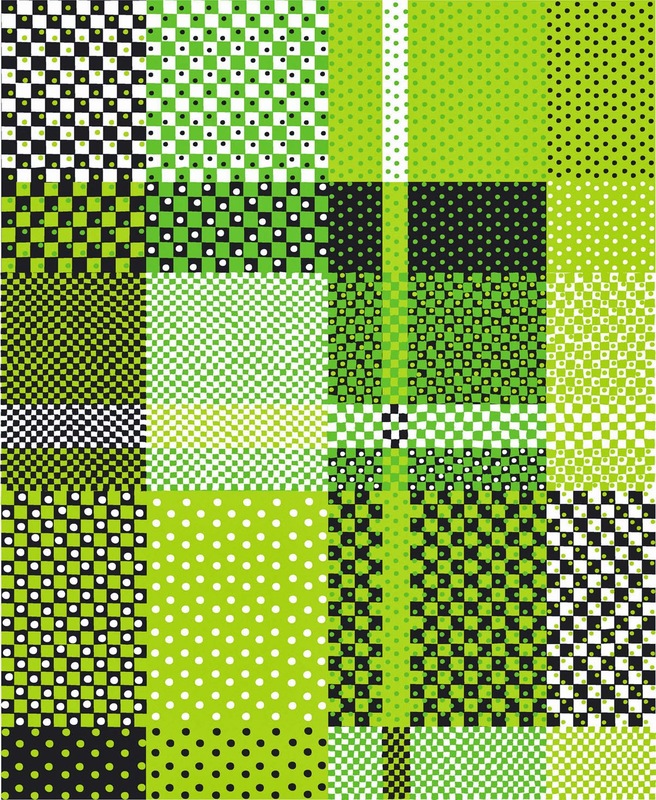 I went with the warm colors mixed with black and white, and at the last minute tried to make it work in lime green mixed with black and white as well. Everyone finds themselves doodling scribbles from time to time. How did your scribble become fabric? I had a scribble design already created, and then one time in the scribble I noticed something that looked like a heart and a flower. 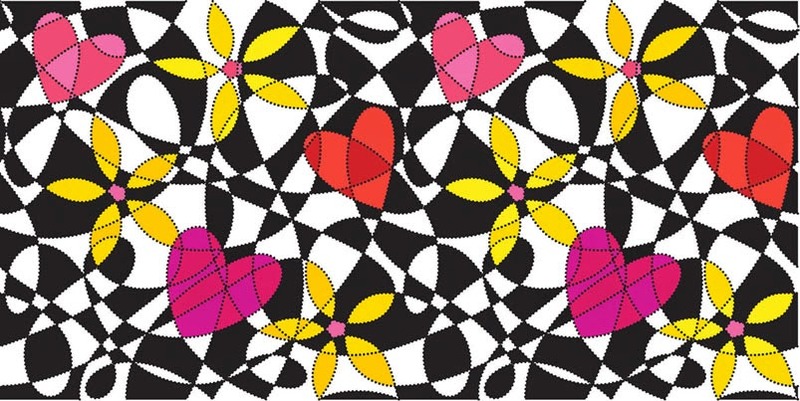 I adjusted the repeat of the pattern to have the hearts and flowers be all over. I like that challenge—making the scribble look random, but having the shapes appear. 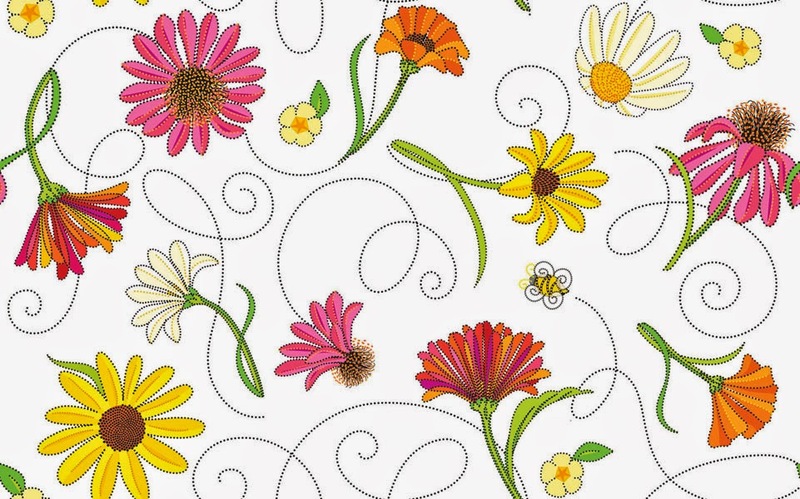 The dotted scribble line works well with the textures in the flowers. Do you have a favorite print in the collection? First, the plaid. I'm excited about it because it's different and it worked. You can play with the pattern and really make something dynamic. Second would be the whirl, in the pink and yellow combination. 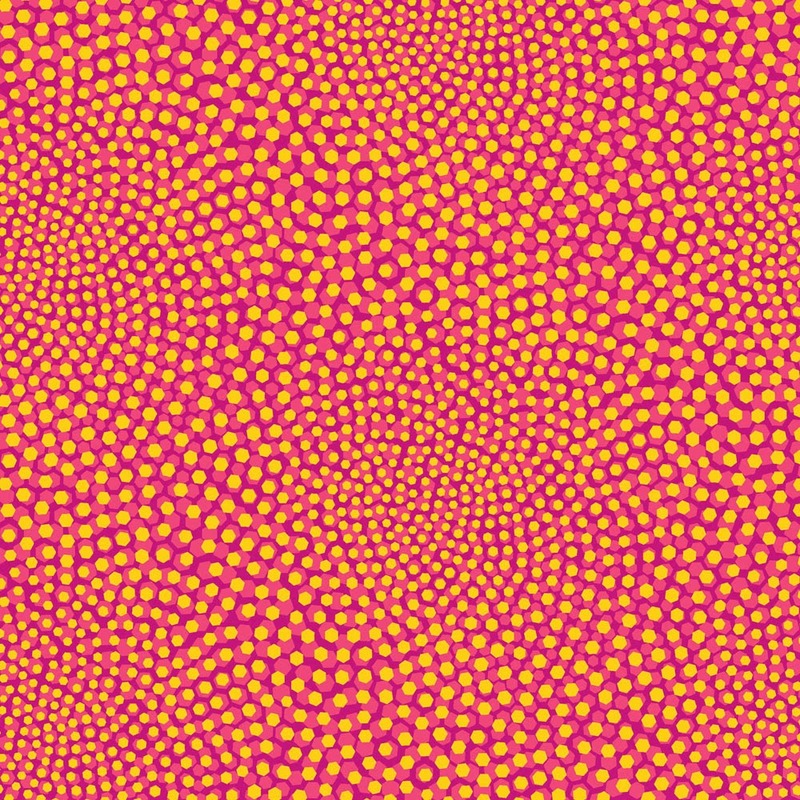 The whirl pattern came from flower centers and it really has a nice texture to it. What makes your panel unique? I chose the mini flower border because I wanted to do something a little bit different. And with designing patterns, I can come up with ways to use it, like on the free quilt pattern. 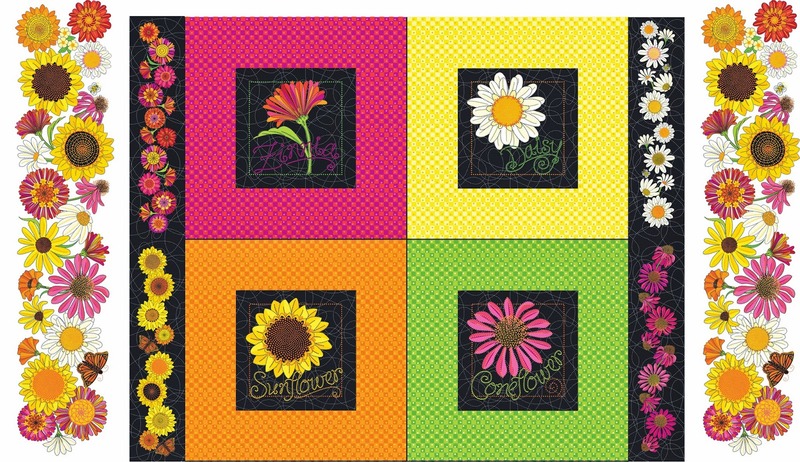 The flower squares have enough room around them to fussy cut squares from 6-1/2'' up to 12''. And the scribble pattern in the background carries the dot through, pulling everything together. You said you love brights. Why do you like this color palette so much? It's kind of fun to play around with the blenders in this collection. Depending on the combinations, you can come up with everything from watermelon colors, to Halloween colors, to just black and white. 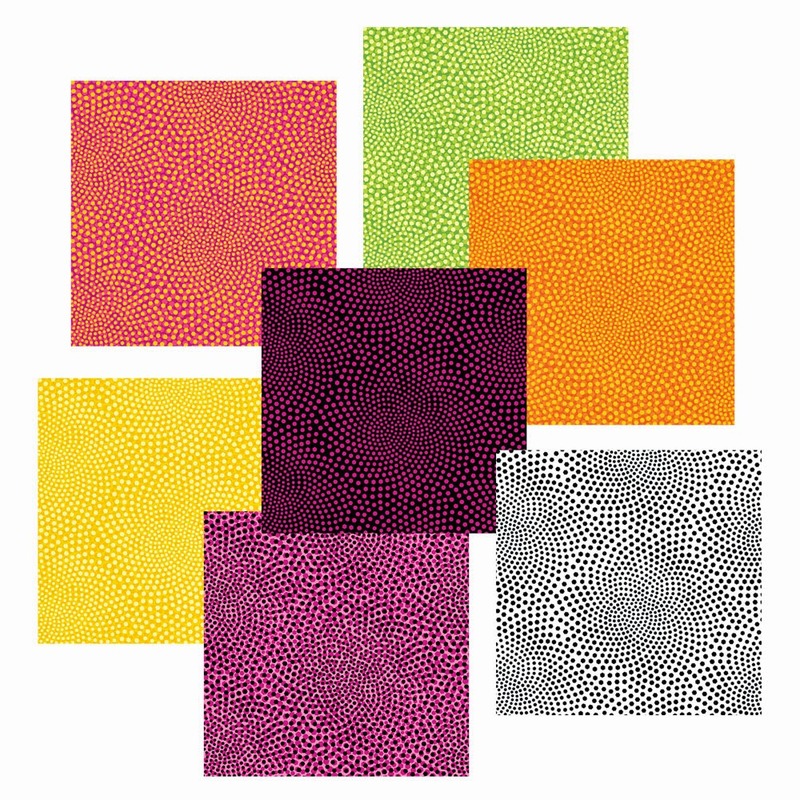 What's the advantage to designing fabric and quilt/project patterns? Ruthann and I work together—it's neat to brainstorm how to use the fabric and how they'll work indifferent patterns. We can take the fabric and design around it for patterns or vice versa. 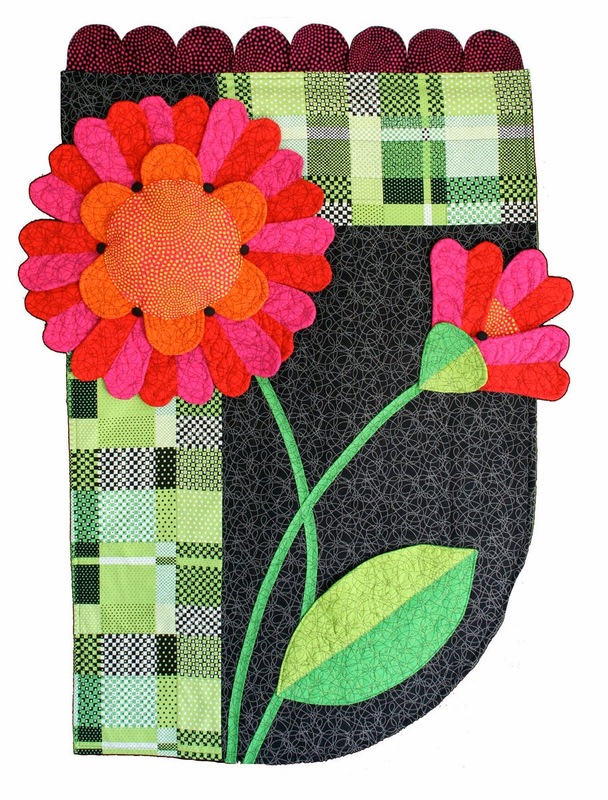 "Brees Blooms" uses the plaid print to create the illusion of a pieced background for the quilt's 3-D components. The oversized dimensional blooms stem from Susans' background as a paper engineer: "I specialize in pop-up and die cuts, and it's been fun to bring those concepts, particularly the 3-D aspect, into patterns." 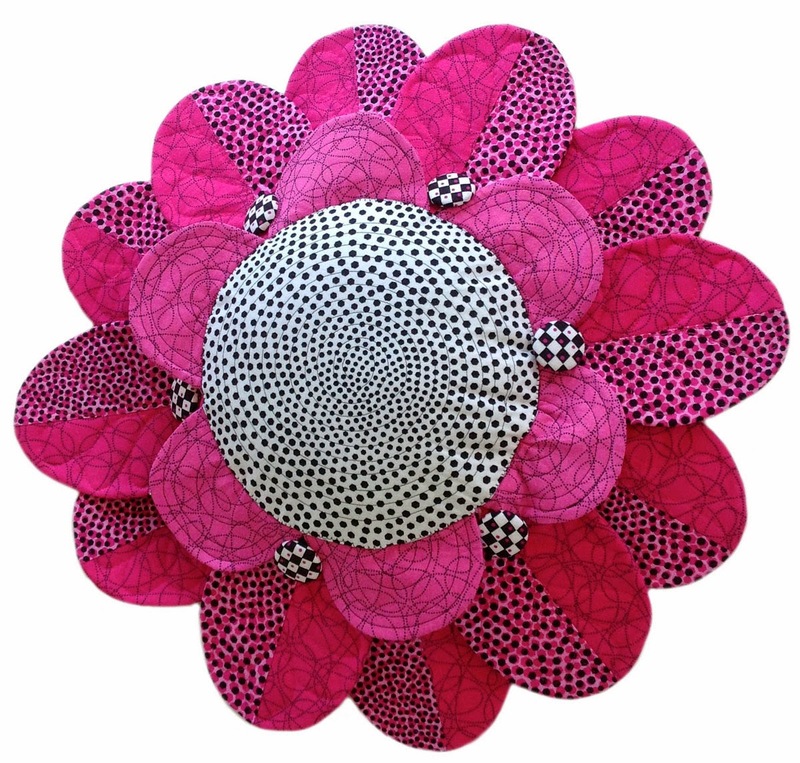 Another dimensional project--a blooming pillow that goes with the Brees Blooms quilt. 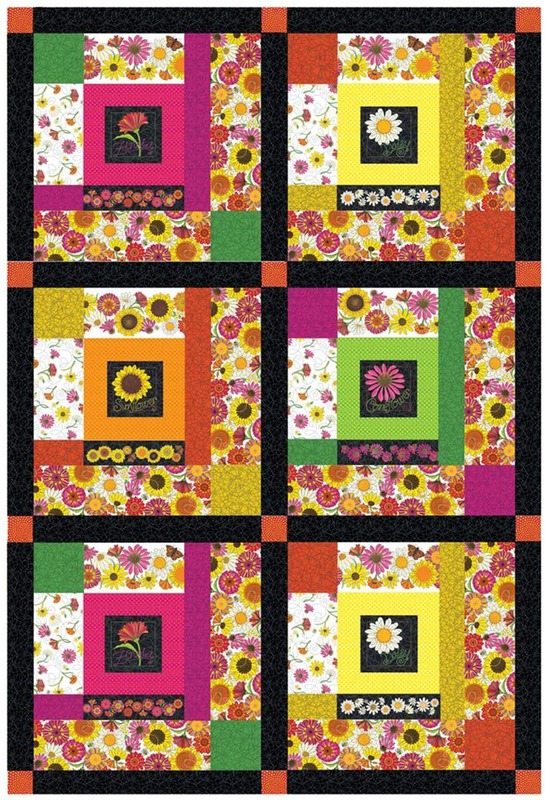 Don't miss Susan's free quilt pattern for her "Breezy Blooms" quilt! 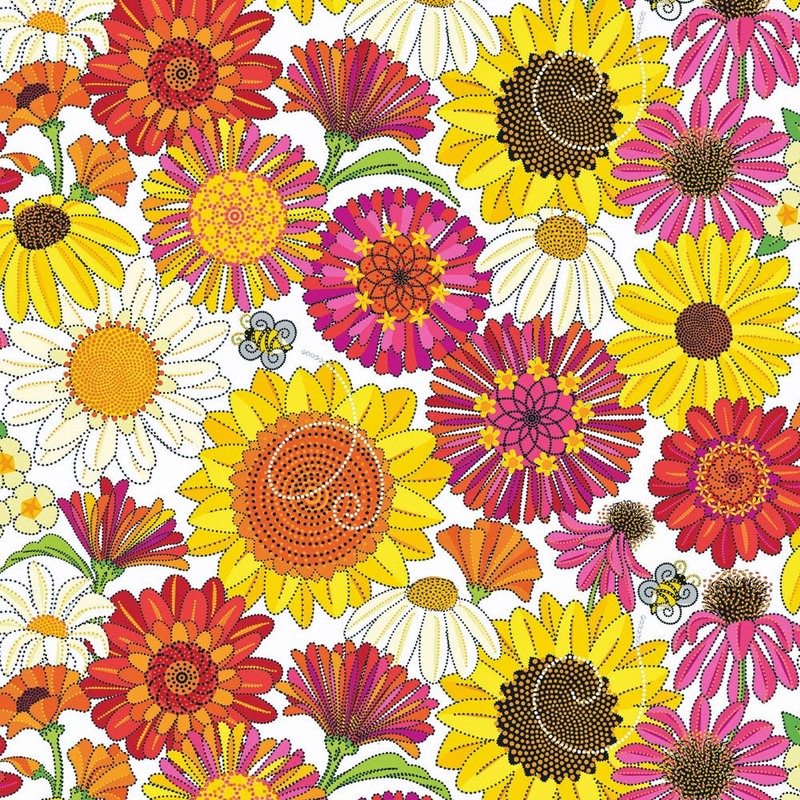 Click here to see the entire Breezy Blooms fabric collection. 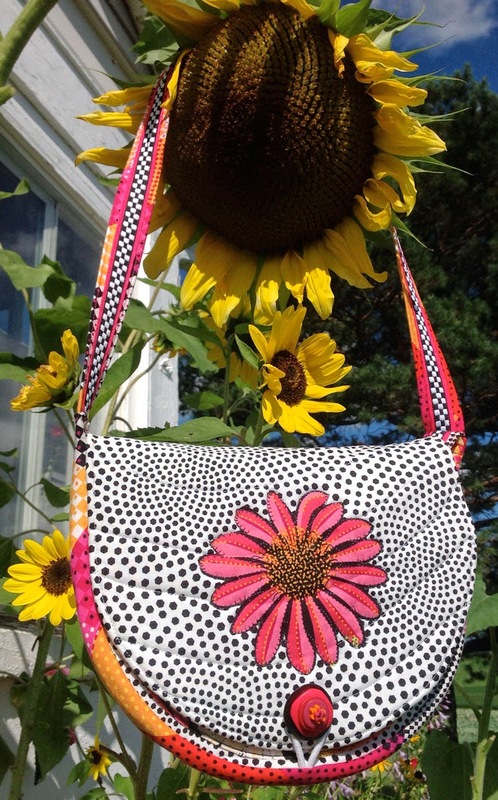 Click here to see more of Susan's patterns and other work, and to find out about ordering patterns. What fun! Love the plaid and whirl.